Laikly is a rigorously made in Italy brand that for his cuts and styles always trusts on latest trends proposed by Milan and Paris fashion shows with a sharp look to the new inventions of London hairstylists. Wigs with human hair (natural hair) can be personalized: you can create the effect that you desire by changing colour, cut and set of your hairdressing. Wigs with synthetic hair are manufactured with superior quality fibre: it is really difficult to distinguish them from natural hair to the touch and to the naked eye! 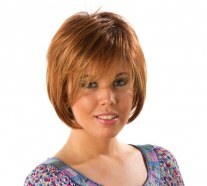 Every wig offers you maximum naturalness without forgetting to be light, transpiring, elastic and comfortable. There are so many models of wigs in synthetic fibre ready-to-dress with fantastic shades of streaks, highlights, roots effects, with a special care for classic cuts and colours. And all this is Laikly: high quality products with a refined style, inspired by up-to-date trends without forgetting the importance of a practical use and the everyday maintenance.